I am Dumisa Thethiwe, one of top 5 Future Stars of 2013. I promised to open up an NGO, and I am proud to say that it has started already. I reached more than 1000 youth already as I hosted an event bringing 5 actors from Generations to motivate the students of 5 high schools and 7 primary schools and the general youth in those communities. 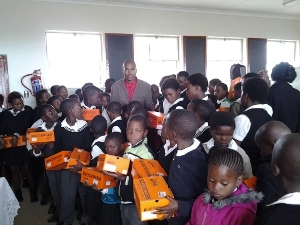 Also I gave more than 800 school shoes and 487 Uniforms to learners who were not attending school as well as to others that were already in school. The meaning of this was to motivate them into going back to school while also supporting those who are at school. What did being a Future Star mean to you? How has having a corporate, like Argo, that believes in you, helped you along your journey? Being a future star tells me that nothing is impossible. If you can imagine it then you can do it. As a boy from a rural area I never thought that South Africa, more especially Argo, could believe in me and youth who are from poor backgrounds. That we can do something to change the world. Now I have confidence on what I am doing after being recognised as a Future Star. Before being a Future Star I was more involved on youth development but not getting the support I needed. But now my organisation is registered through help I got from Argo. First, I may say that the moment I was awarded the Award my life changed. More people believe in me as they can see now what is my dream. Now I have more people to assist me with what I am doing. Be yourself don’t try to impress others. Make use of what you have to get what you don’t have. Be patient, things don’t come easily. Be surrounded by people that could help you reach your dreams. In the next 5 years, I want to get a degree on Leadership. Also build the organisation building, so that I can be able to do all the tasks of the organisation which would be the Centre called Iqhayiya Lethu Youth Development Centre. Currently it’s operating from my mother’s house.